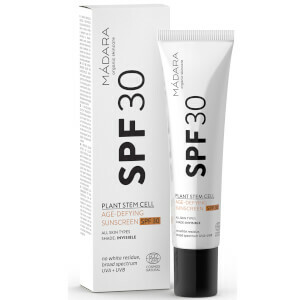 Keep skin safe in the sun with MÁDARA Plant Stem Cell Antioxidant Sunscreen SPF30, a high protection sunscreen suitable for the hands, face and body. Delivering broad spectrum protection against UVA/UVB rays, the silky, water-resistant sun lotion glides onto skin with a translucent finish, protecting against external damage and helping to prevent premature ageing. It contains patent-pending stem cells from Northern Dragonhead for antioxidant protection, plus Raspberry Seed Oil and Vitamin E for their SPF-enhancing and restorative benefits. Enriched with a zesty fragrance. Free from nuts and gluten. Aloe Barbadensis (Aloe) Leaf Juice, Zinc Oxide, Isoamyl Laurate, Dicaprylyl Carbonate, Glycerin, Sorbitan Olivate, Beeswax, Lecithin, Polyglyceryl-2 Dipolyhydroxystearate, Silica, Dracocephalum Ruyschiana (Dragonhead) Cell Culture Extract, Rubus Idaeus (Raspberry) Seed Oil, Cellulose, Sodium Chloride, Sorbitan Caprylate, Aroma, Palmitic Acid, Stearic Acid, Propanediol, Benzoic Acid, Aqua, Ascorbyl Palmitate (Vitamin C), Sodium Phytate, Tocopherol, Potassium Hydroxide, Citral, Citronellol, Linalool, Geraniol, Limonene.